The Alkaline diet includes those foods that can protect your body against conditions like arthritis, cancer and also helps you lose weight naturally. Alkaline diet is also referred to as Alkaline ash diet, alkaline acid diet, acid ash diet, acid alkaline diet or pH diet is the one that help balance the blood pH levels of the fluids in your body. Replacing acid forming foods with alkaline foods can improve health naturally. Alkaline diet supports vegetables and fruits over grains and animal products. According to Acid Ash Hypothesis, the protein in animal products and grains produces high acid load in the body and releases calcium from the bones leading to osteoporosis. It is believed that consuming acid inducing foods and drinks creates an unhealthy cellular environment that sends distress signals throughout the body leading to cold, outbreaks and inflammations. Foods we eat can alter the acidity and alkalinity (the pH value) of our body. The pH from 0 -7 is considered acidic, 7 is neutral while pH from 7-14 is alkaline or basic. When food is digested which means when you eat food, your body burns food and turns it into energy leaving behind the acidic or alkaline ash in the body which makes the body either acidic or alkaline. Acidic ash leads to many diseases while alkaline ash protects the body. The Alkaline diet emphasized alkaline foods in an attempt to make the body’s pH more alkaline. Raw or Uncooked foods are considered life giving. Cooking foods deplete alkalizing minerals. Most plant-based products, fruits and vegetables, soybeans and tofu, nuts, seeds, green juices and legumes are considered to be alkaline promoting foods. Diets consisting of highly alkaline foods such as unprocessed plant-based sources of proteins result in more alkaline urine pH level which helps protect healthy cells and balance essential mineral levels. Foods affects the pH of the urine and but cannot change the pH of the blood. Citrus foods that seem to be acidic are actually considered alkaline producing. 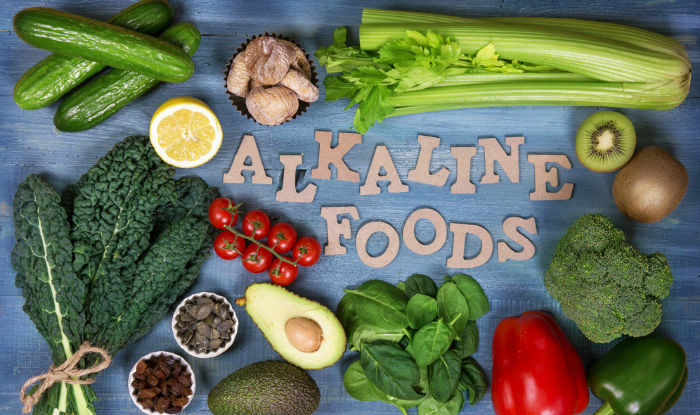 Alkaline diet focuses on marinating optimal pH by limiting acid inducing foods and drinks like caffeine and alcohol, meat and dairy and other processed and fried foods with alkaline inducing foods. People with chronic kidney conditions also benefit from alkaline foods as too much protein is hard on the kidneys. It is proved that by reducing acid load to the kidneys through a low protein diet (protein from plants only) helps in improving the kidney functions and slows down the kidney disease progression. Alkalizing has other positive effects like strong bones and muscles, reduce the chances of kidney stones, vitamin D deficiency, reduce chronic diseases like hypertension and stroke and also reduce the risk of type 2 diabetes. The Alkaline diet helps prevent plaque formation in blood vessels and reduce muscle wasting or spasms. The alkaline mineral neutralizes the acid and helps muscles relax thereby the diet is beneficial for those suffering from back pains too. The Alkaline diet also has the potential to improve cardiovascular health, improve memory and cognition. Alkaline foods raise the pH level in the mouth via saliva and may improve the oral health. Vegetables like Asparagus, broccoli, capsicum/bell peppers, zucchini, dandelion, green beans, string beans, spinach, cabbage, cauliflower, sweet potatoes, figs, mushrooms, tomatoes, ginger, beetroot, garlic, onion, parsley, celery, cucumber, eggplants,kale, watercress , swiss chard , lettuce, carrots, pumpkin, radish, squashes , peas etc. Fruits like watermelon, ripe bananas, papaya, cantaloupe, tangereines, kiwi, cherries, pineapples, strawberries, balck berries and raspberries, apples, pears, pomegranate and grapefruits. Fresh coconut is also part of alkaline diet. Herbs like mint, basil, oregano, coriander, bay leaves, cayenne pepper, black pepper, cinnamon, green grass such as wheatgrass are considered Alkaline. The best among alkaline diet are Sprouts like all sprouted seeds, nuts and grains, alfalfa sprouts, mung bean sprouts from germinated plants are the healthiest and most nutritious foods that should be consumed on daily basis. Sprouting brings out the health benefits of the base plant as well as the enzymes created from the process of sprouting. One should opt for sprouted bread, sprouted wraps and gluten free, yeast free breads only. Plant Proteins like almonds, navy beans , pinto beans, red beans , white beans and lima beans . Seeds that are alkaline in nature are flax seeds, pumpkin seeds, sesame seeds,flaxseeds and sunflower seeds. Oils that are alkaline include Avocado oil, Coconut oil, Flax oil , Cod liver oil and Olive Oil. Alkaline water has a pH of 9 . Adding lemon or lime or baking soda to the water boosts its alkalinity. Ginger and Herbal teas are also alkaline. Foods that are acidic and therefore limited on an alkaline diet includes high sodium foods, processed grains, meats, foods high in sugar and also dairy products (except yogurt and kefir and also clarified butter or ghee). There is abundance of foods made by the mother earth that can actually make our body work better, stay healthier and live longer. By consuming foods that maintain proper pH levels rather than stressing the body to self correct its pH levels , one can reduce inflammations , boost immunity and improve the overall health . Eating high alkaline foods simply means you are eating more of certain foods that help prevent your blood from becoming too acidic which promotes your health in all possible ways. 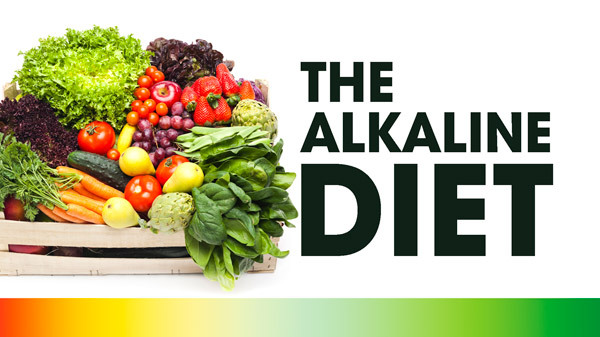 Alkaline diet helps to excrete the compounds you do not need and retain the ones you do. It is important to understand that “alkaline diet” is more of a theory than a specific plan. Many health professionals believe that our body is inherently designed to maintain the pH balance so alkaline diet is not needed, but consuming alkaline diet naturally slashes sugar and salt intake by the body which has positive effects on the overall wellbeing. The diet focuses on consuming more fruits and vegetables that are packed with minerals and vitamins.